Is There a Strategy Behind Trump’s Trade War? own, doing attended by only advisers hand-picked for agreeing or acquiescing, as he pleases with our country ripping up United States trade relations just about everywhere. Conservative columnist Bret Stephens says "the administration is blowing up the foundations of global economic order with the same mindless glee as a child popping bubble wrap". Section 8 of Article I lists as one of the duties of Congress the power to "To regulate Commerce with foreign Nations", but in 1962 John F. Kennedy signed the Trade Expansion Act which ceded control of tariffs to the president. It has been used sparingly when survival of an industry is threatened  Obama on tires, George W. Bush on selected steel products for almost two years. Authors of the law presumably would be astonished to see the wholesale use to which Trump is putting the Act. And there's no movement in Congress to take back its role. "…an article is being imported into the United States in such quantities or under such circumstances as to threaten or impair the national security." That was Trump's claim when on March 6th he invoked the 25% tariff on steel and 10% on aluminum and what he proposes to use to justify a 25% tariff on imported autos. He thus declares Canada and cars to be threats to America's security. Canada's Prime Minister Justin Trudeau called it "insulting", and reminded our president that Canadians had "fought and died" alongside American GIs from World War II to Afghanistan and, by the way, Canadian aluminum and steel are integral to America's national defense. "So you go tariff-free, you go barrier-free, you go subsidy-free. That's the way you learned at the Wharton School of finance. I mean that would be the ultimate thing." This outcome is very much the path Obama had paved, a deal called the Transatlantic Trade and Investment Partnership with Europe. Better not tel Donald Trump that. Trump's threatened 25% tariff on imported autos again attacks indiscriminately and will be met with returned fire from all auto producing countries. Are we in jeopardy from these imports? None of the auto makers want protective tariffs. Of all cars in the US, 56% are made in domestic plants; 78% if you count Canada and Mexico which are so closely intertwined, assembling parts shipped to them from US automakers and sending the cars back here. And foreign companies have 17 assembly plants in the US which build autos here for the domestic market and export. Mercedes and BMW export 400,000 cars a year from its US facilities. BMW has its biggest plant in the world in Spartenburg, South Carolina, employing 10,000. Mercedes-Benz is in Charleston, South Carolina, and Tuscalooa, Alabama. Volkswagen is in Chattanooga Tennessee. The South is an automotive powerhouse. Does Trump know any of this? Seemingly not. At a rally in Charleston in March he threatened Mercedes and BMW explicitly with tariffs. The most serious threat to our national security is China and, as relates to trade, President Trump is simultaneously infuriated by our gaping trade imbalance and China's devious practices against our companies attempting to operate businesses there. Most deceitful is the requirement as the ticket of admission to the Chinese market that US and other foreign companies partner with local companies to which they must transfer propriety technology. That, in conjunction with the outright cyber theft of burrowing into American and European corporate files via the Internet, is how China has been advancing its industrial capability at so rapid a pace. But the president's emphasis with his escalating tariff schedules has been on the trade deficit. In June he directed US Trade Representative Robert Lighthizer to come up with proposed tariffs on $200 billion in additional Chinese imports to add to the $50 billion already in effect. 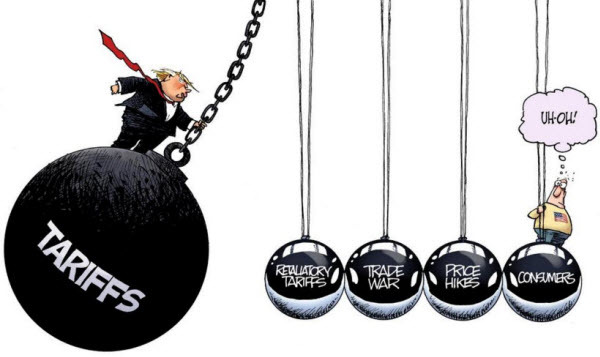 At the beginning of August, China announced $60 billion in further tariffs in response, Trump, angered that China had not yielded, ratcheted up to 25% the tariff he had originally pegged at 10% for the $200 billion. He's warned he'll keep expanding tariffs to all of the $505 billion in goods we import from China (the 2017 total), because that's the wildly indirect method he expects to get China to put a stop to its extortionist technology transfer and theft of intellectual property. China will of course tariff all of the $130 billion that we export and will load up on other measures  harassment of US businesses with restrictions and licensing, slow delivery from ports, etc.  in an attempt to compensate for the trade imbalance that for once has boomeranged to their disadvantage. Of course, China holds $1.2 trillion of our treasury obligations. It could begin a sell-off, causing our government to bid up interest rates to attract money from everywhere to pay the mounting deficits of the Trump government's tax cuts. 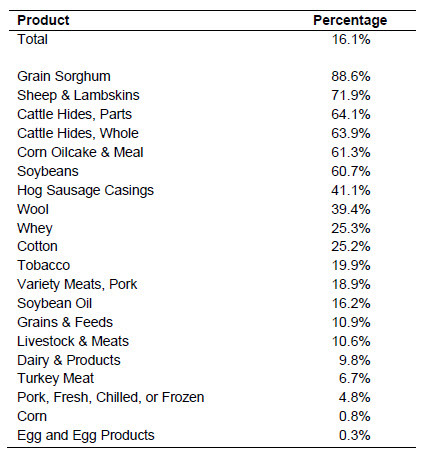 Percentages of American agricultural proucts exported to China. "This is becoming more and more like a Soviet type of economy here: commissars deciding who's going to be granted waivers, commissars in the administration figuring out how they're going to sprinkle around benefits". The tariffs' increased costs of intermediate materials will make our manufactured goods pricier, leading to lost sales to foreign competitors and job losses at home. Consumers will see rising prices for everything that says "Made in China" on its underside. The Fed will raise interest rates to combat that inflation  all of this chipping away at his administration's triumphant tax cuts. Fair enough that he has taken strong action, whereas neither the Obama nor the Bush 43 administrations did a thing against China other than to say please stop. But the question is why Trump didn't at the outset take the far more direct approach available to him: issue an executive order banning US companies from sharing technology. China's dictate that foreign corporations must share their technology if they want to do business there is explicitly prohibited by World Trade Organization rules, rules that China agreed to when it joined the organization in 2001, along with other rules that China has been flouting ever since. China says it is innocent because US companies volunteer to share their technology. That's nonsense. The Trump administration could then have gone to Congress for a law to replace the executive order so as to prescribe fines for American companies that cheat. The Foreign Corrupt Practices Act already has the mechanisms in place, providing a speedy vehicle to get Congress to act. We could then have added targeted responses to all discovered instances of counterfeiting of US products and industrial secrets theft, invoking tariffs against specific product categories in retaliation or banning their entry into the US market outright. Instead Trump has launched a broad scale tariff war aimed at everything and with no clearly stated objective. As a member of the WTO, the US is obliged to apply to its appellate body that adjudicates disputes. Disdainful of the WTO, Donald Trump went ahead with tariffs on his own, without involving the Geneva-based institution. Indeed, Trump wants the US to withdraw from it, as he has done with the Trans-Pacific Partnership, the Paris climate accords, the European trade initiative, the Iran nuclear pact  all of which were initiated by President Obama. To hobble the WTO, he has withheld US consensus on appointments to the seven-person appellate body. Three seats are vacant, halving the number of three-person teams that hear cases. Expiration of the panel's four-year terms will cut the number to three judges come September. By the end of next year there will only be one judge left. Once again this one person, Donald Trump, has decided on his own, without any consent of the Congress that approved US membership in the WTO, to do whatever he pleases to cripple an organization of 164 nations that accounts for 98% of world trade. He is said to be resentful that other countries have won most of the 145 cases they've brought against American protectionist actions. He brushes aside that Washington has won 85% of the 117 cases we have brought against other countries. Trump notoriously acts impulsively on minimal knowledge without consideration of consequence. The WTO forbids discrimination against any nation's products and requires that a member country charge the same tariff to all partners for any given imported item. That's what Trump would throw away if he impetuously removes the US from the WTO. America would be left with having to negotiate with 163 countries, one by one. Each of them will be free to refuse acceptance of US exports or to charge sky's-the-limit tariffs. American export business would plummet. Disputes would have no arbitration body to turn to if we accuse another nation of unfair conduct. The WTO is the only global international organization dealing with the rules of trade between nations. Trump would invite disaster. So far, the Trump administration has gone through the correct motions  it filed a complaint about technology transfer with the WTO in March. The European Union filed a similar complaint in June. The WTO by rule has 90 days to answer, but it is now August, unsurprising given that the few judges left can only handle one dispute at a time. China's admittance to the WTO was supposed to be transformative. They would gain global access for their wares, the world would finally gain unimpeded access to the Chinese market. It didn't turn out that way. China had only self aggrandizement in mind as it embarked on its plan of mercantilist exploitation: looking only to gain at the expense of others, China blocked entry to whole industrial categories, continued to operate and subsidize giant state-owned monopolies, repeatedly broke promises to crack down on stolen intellectual property, and most larcenous of all preyed on foreign companies to appropriate their technology. It is long past time for US companies to take whatever hit that comes from refusing to cave to China's parasitic demands any further. The multinationals never should have acquiesced to such demands in the first place: deliberately nurturing fledgling Chinese companies who will, often with illegal state backing, grow on the usurped technology, drive out our companies, compete with them at cheaper prices worldwide. But profits from the Chinese market of 1.3 billion people was all our corporations cared about, heedless of the more ominous foretelling, clear from a long way off, that for their short-term money-making they would be helping China build a colossus that is now on track to surpass the US and could lead to a disastrous war. Trump is the BULL (Elephant) in America’s China shop! Surely he will be stopped at the next elections? Wake up America! Like every other policy or decision he initiates, President Trump’s trade policy appears to be headed for disaster. If Russia or China wanted to plant a mole in the heart of the U.S. government, they could not have found a better agent. When will a Republican Congress stop enabling him and defend the rights of Congress and the American people?